Todd Huff had trouble managing his weight for most of his life but was finally able to lose over 100 pounds and keep it off by following some simple strategies. Huff says that diets don’t work because they are someone else’s idea of the correct way to lose weight, which may not necessarily be right for you. 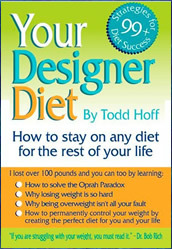 In his book, Your Designer Diet, he shares what he has learned about dieting and helps you to develop a plan that is designed uniquely to suit your body and your lifestyle. Your Designer Diet is not a typical structured diet plan but rather teaches you how to lose weight by paying attention to the different areas of your life. You will learn to control the behavioral and emotional reactions that may be triggering weight gain, experiment with different ways to improve your eating habits and discover more about the techniques that work best for you. According to Huff there is no single problem that has caused you to be overweight, which means that there is also not just one single solution. To lose weight you need a designer plan that takes into account your individuality and identifies your challenges, while emphasizing your strengths. The result is that you will be empowered to lose weight as you constantly improve your diet and lifestyle. By using a simple step-by-step process you develop a designer diet plan that will allow you to lose weight as well as to maintain your ideal weight through following a healthy lifestyle. Instead of teaching you what to eat, Your Designer Diet gives you the information to explain why it has been so hard for you to stay on a diet in the past. You then are provided with strategies and positive skills that will help you to finally overcome the obstacles to successful weight loss. Baby carrots, spinach, fruit, hard-boiled eggs, legumes, salsa, fat-free popcorn, meal replacement shakes, frozen dinners. Your Designer Diet does not include a meal plan. The book includes strategies that will help you to naturally increase the amount of physical exercise you get from your daily activities. You will also identify the things that may be interfering with your motivation or ability to exercise so that you can learn to overcome them. Your Designer Diet retails at $19.95. Allows you to customize a diet to suit your unique needs. Can be used in conjunction with any preferred diet plan. Dieters have the flexibility to choose their own foods according to preferences. Addresses the role of psychological factors for effective weight control. Encourages daily weight monitoring, which has been associated with a greater chance of successful weight loss. The Designer Diet Website offers additional support tools. Does not include a structured diet plan. Dieters will need to find information from other sources regarding how to select healthy foods for weight loss. Your Designer Diet helps you to identify the factors that may be interfering with your ability to lose weight and discover the method that will work the best for your body and your lifestyle. The Designer Diet provides dieters with a large array of practical strategies that can be used to create a customized plan that can form the foundation of a lifestyle approach to healthy weight management.